PLEASE NOTE: Enrollment for these workshops is by application only. Each session consists of an introductory arrival afternoon and evening, five full studio days, and a half-day summary presentation session before departure. Limited to 15 participants per session plus one assistant. Aimone Art Services invites all artists to apply to participate in our Seventh Annual Master Series Residency Workshops at the beautiful Atlantic Center for the Arts. Over the years, participants have found these workshop/retreats to be life and career changing experiences. This week of immersion with Steven Aimone often serve as springboard for creative and professional breakthroughs. Each artist will write and focus on an individual contracts to explore certain territory that serves as a genesis points for work during the retreat. One-on-one coaching and interactive discussion take place throughout in a comfortable and safe environment for all participants. Group discussion is encouraged and facilitated. 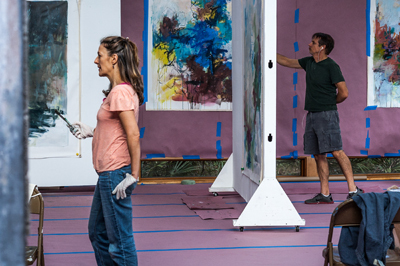 Participating artists enjoy generous work spaces which are accessible 24-hours daily. We all dine and lodge together on the gorgeous ACA campus where life's distractions are kept to a minimum. Applicants are chosen based on their work and space considerations, since these workshops are limited to 15 students plus an assistant. Applicants may indicate a session date preference. Applicants may apply to attend one or both sessions. On or before November 10 you will be notified by email as to whether or not you are admitted to the workshop. If you do not have preference for either of the workshop weeks, please let us know when you fill out the application. If you are admitted, you will pay a deposit for the workshop to hold your place. We will include all of that info in a follow-up letter. PLEASE READ WHAT OTHERS ARE SAYING ABOUT THIS GREAT ADVENTURE IN PAINTING! A Steve Aimone workshop at the prestigious ACA is like going to painting heaven. He has the gift of summoning the best from his students and creates a space for students to reach beyond where they have been before—a place of safety and support, where risks are encouraged and magic happens. Because of his leadership, there is a sense of connectedness among all participants that is nurturing, accepting, and loving. And, there is laughter! All of this on a beautiful campus set amid the lush landscape of the Florida coast. I recommend the Master Series Workshops unreservedly. I found my teacher when I found Steven Aimone. I bought Steve's book and began experimenting with the challenges and watched my work transform. I took the Master Residency at the ACA in 2015, and the change in my work has been nothing short of miraculous. The ACA isa not-to-be-missed experience for any abstract artist. Aimone is one of the best teachers I have experienced in any field. He is a masterful mentor under whose tutelage students soar in their development and a deeply kind person who encourages and enables students to paint intuitively from their truth. Attending the Directed Individual Study Retreats at ACA with Steve Aimone has produced major changes in my art-making. This is a total immersion experience with talented artists, a gifted mentor, a beautiful environment, fabulous studio space, and delicious food. We live, breathe, talk, and make art. We share stories— worries, blocks, vulnerabilities, and breakthroughs—it is a situation in which I have made friends for life. Steve nudges us along on our individual journeys in a generous and skillful way, helping us overcome our personal art demons. There is just no place and no experience like it! I enjoyed my experience at ACA on many levels. Steve Aimone was a wonderful catalyst for helping us get to know one another, and he continued to share a warm and open dialogue with us throughout the week. He is a skilled facilitator and thoughtful mentor in his one-on-one dialogues, as well as group discussions. The artists I met at AAC were amazing and some will remain life-long friends. The environment at the Center is comfortable—the grounds beautiful and inspiring. I found the Aimone residency to be rich in content and very rewarding. I feel confident recommending it to others interested in furthering their work. Both Katherine and Steve bring something special to the experience along with all the talented artists that attend these residencies.